The Henry Samueli School of Engineering held its Annual Dinner and Awards Banquet on Thursday, May 5, at The Arnold and Mabel Beckman Center of the National Academies of Sciences and Engineering, Irvine. 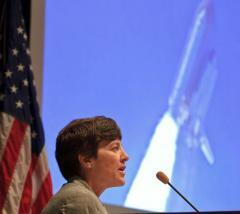 Captain Wendy B. Lawrence, a former NASA Astronaut, was the keynote speaker. This annual event provides an opportunity to honor those who have been instrumental in moving the School forward, to reflect on our many accomplishments, and to celebrate our promising future. What made the evening especially poignant is that it was also the 50th anniversary of the day NASA astronaut Alan B. Shepard, Jr. became the first American in space on May 5, 1961. Shepard became just the second man in space as he piloted the Freedom 7 mission for a 15 minute sub-orbital flight 116 miles above the Earth. Among the 200 guests in attendance were UC Irvine Chancellor Michael V. Drake, M.D. ; Executive Vice Chancellor and Provost Michael R. Gottfredson, Ph.D.; Dr. Henry and Susan Samueli, benefactors of the Samueli School; and former dean Nicolaos Alexopoulos, Ph.D., and his wife Sue; Paul Bevilaqua, Ph.D., manager of advanced development programs at Lockheed Martin Corporation, SKUNK WORKS® where he played a leading role in creating the Joint Strike Fighter; Dan Gurney, a retired race car driver, member of the International Motorsports Hall of Fame, and creator of the “Gurney Flap;” Alexander Gurney, a two-time race car winner of the GRAND-AM Rolex Series Championships. Lawrence, a veteran of four space flights, including the “Shuttle Return to Flight” mission (STS-114), spoke about the challenges of preparing the crew and the Space Shuttle Discovery for the return to space 907 days after the Space Shuttle Columbia disaster. Lawrence then discussed the problem solving on STS-114 when they encountered a different challenge than they anticipated and how the best solution to a problem will sometimes present itself when the right questions are asked of colleagues throughout the organization. She closed her keynote address by answering questions about life in space and the future of space travel. The Samueli School was also pleased to honor three additional faculty members in recognition and appreciation of their numerous contributions to advancing research and enhancing the quality of teaching at UC Irvine. The first two awards were sponsored by Fariborz Maseeh, Sc.D., founder and president of The Massiah Foundation, a charitable organization which invests in transformational situations for broad public benefit. He is internationally recognized as an expert in the field of micro-electro-mechanical systems (MEMS). Farghalli A. Mohamed, Ph.D., professor of chemical engineering and materials science, civil and environmental engineering, and mechanical and aerospace engineering, was given the Dr. Fariborz Maseeh Outstanding Faculty Research Award for distinguished contributions to understanding high-temperature mechanical behavior in structural materials and for encouraging undergraduates to participate in research. Michael W. Berns, Ph.D., professor of biomedical engineering, was presented the Dr. Fariborz Maseeh Outstanding Faculty Teaching Award for his innovative and inspiring contributions to the biomedical engineering curriculum, and in particular his development of the multidisciplinary course ‘Photomedicine’ that is making unique impacts in the education of undergraduates in the field of biophotonics. The final award of the evening, the Northrop Grumman Excellence in Teaching Award, was given to Faryar Jabbari, Ph.D., professor of mechanical and aerospace engineering, for his steadfast commitment to teaching excellence, particularly at the undergraduate level, in teaching core classes with large enrollments, including the MAE80 Dynamics course, as well as a variety of graduate courses. The event was sponsored at the “Silver” level by Abbott Medical Optics, Inc.; Emulex Corporation; Dr. Fariborz Maseeh, The Massiah Foundation; and The Henry T. Nicholas, III Foundation and Nicholas Academic Centers. “Contributing” level sponsors were The Boeing Company; Stacey Nicholas; and Northrop Grumman Corporation. The “Supporting” level sponsors were Bausch & Lomb; The Beall Family; DRS Defense Solutions, Edwards Lifesciences Corporation; Paul Singarella and Latham & Watkins, LLP; Microsemi Corporation; Mindspeed Technologies; NPI Services, Inc.; Parker Aerospace, Rockwell Collins; Thales Avionics, Inc.; and Versant Ventures. Additionally, there were three individual sponsors: Robert A. and Barbara L. Kleist; Dr. Goran and Susan Matijasevic; and James P. Spoto.Net proceeds from the evening are being allocated to the Dean’s Discretionary Fund to accomplish the mission of the School.